Every now and then, an auction comes along that takes the world’s breath away. This November, Sotheby’s will feature one that could transfix even the most sophisticated of collectors. The Royal Jewels from the Bourbon-Parme Family. This is the first time in nearly 200 years that this collection will be available for public view, providing an unprecedented insight into the turbulent course of events that affected the royal family. Who Were the Bourbon-Parme Family? Descended from Louis XIV of France, the Holy Roman Emperor and from Pope Paul III, the Bourbon-Parma family is linked by blood to the most important ruling families of Europe. Members of the lineage include Kings of France and Spain, Emperors of Austria and the Dukes of Parma. The royal Bourbon-Parma family itself has been an instrumental part of changing the course of Europe’s past. This exquisite collection demonstrates the extraordinary opulence of the time and is led by a group of jewels that once belonged to Queen Marie Antoinette, arguably the most famous Queen of France in history. jewelry’ for auction, each piece is saturated with its own piece of historical and noble connections to the great royal houses of Europe. Of course, not everyone is privileged enough to attend —let alone bid— this unprecedented auction. Luckily, Sotheby’s has released a sneak peek into the collection. Here is a highlight of some of the collections most talked about pieces. 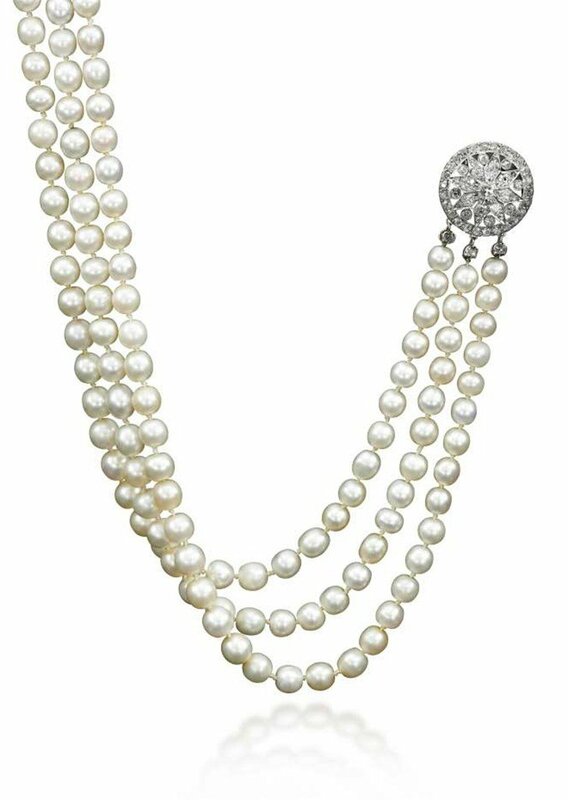 pearl and diamond necklace vary, with some estimated reaching all the way up to $1-2 million. Given by Archduke Frederic of Austria of his daughter, Archduchess Marie Anne of Austria, Princess Elle de Bourbon Parme, for the birth of her sone, Charles in 1905 this diamond bow brooch featuring a 6.89-carat Burmese ruby will make your jaw drop. The brooch has been estimated at a presale value of $200,000 to $300,000. As a wedding gift, Archduchess Maria Anna of Austria received a diamond tiara with a foliate scroll design, in 1902. This was given to her by her uncle, Emperor Franz Josep to celebrate her union with Elias of Bourbon, Duke of Parme. The estimated value for the piece is $80,000 to $120,000, and it’s a creation of Köchert, a Viennese jeweler. There is no doubt that this auction will mark a crucial point in the history of these jewels. The exclusivity alone is bound to attract some of the most arduous collectors the surface of the planet. The good news is, even if you can’t be there, you can still start a legacy of your own. You can endow your family with its own piece of splendor that can be passed on, from generation to generation. At The Diamond Reserve, we can help you find a unique diamond that will encapsulate the significance of family values. All our diamonds are GIA certified. This means you’ll be acquiring an authentic one-of-a-kind jewel that is truly precious. Get in touch today to schedule an appointment and find out more! Shining Stars: The 70th Annual Emmys Brings Out The Bling!